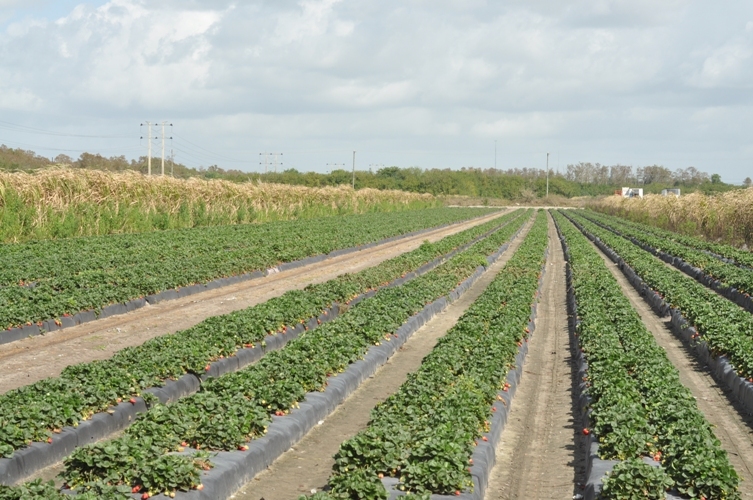 The other day we all went to a pick your own strawberry farm here in South Florida. I remember as a child going to a strawberry field every summer near Owen Sound and spending the afternoon with my mom and younger brother picking berries. I think more were eaten than picked but these are cherished childhood memories and even now, as an adult going to a pick your own farm brings these good memories flooding back. It’s a great way to spend quality time with loved ones and a wonderful way for children to learn about where food comes from. All in all it is something I think everyone should try at least once. Just remember to leave the cell phones behind so that you can thoroughly relish in the moment and the wonder of what mother nature provides. 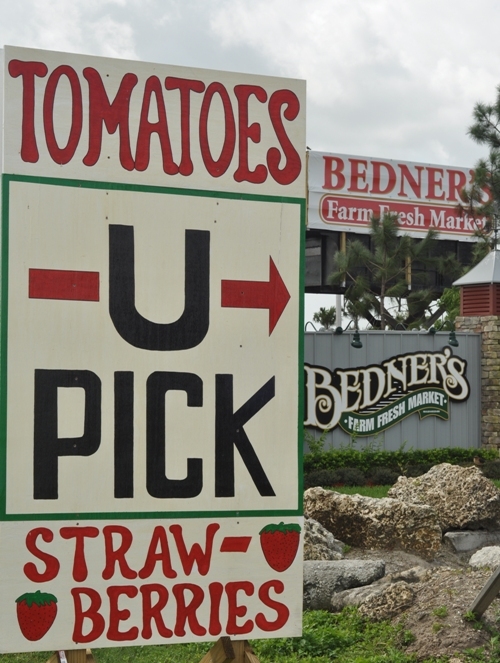 Bedner’s is a pick your own farm about 20 minutes from where my mom lives. You take a tractor ride out to the fields where you arrive to find endless rows of strawberry plants all teaming with large red delicious berries. The beds are slightly raised and covered in black plastic that keeps the soil from washing away. I greatly appreciated the raised beds because I’m having some trouble with my back but I wasn’t thrilled to see so much plastic. 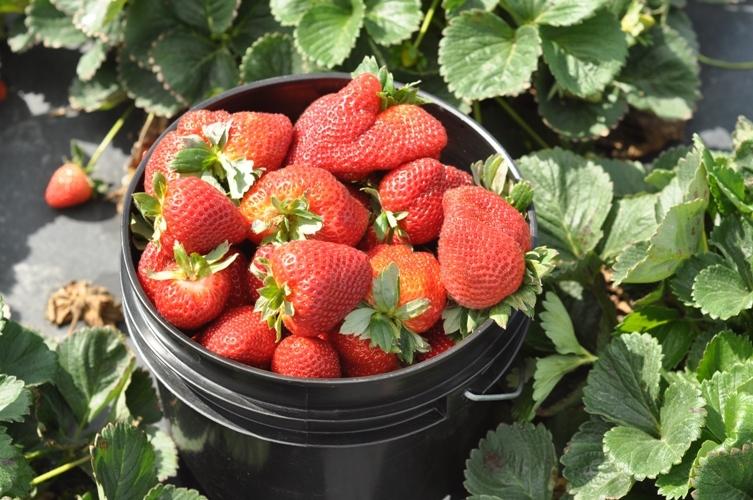 Strawberries are available to pick at Bedner’s for approximately 3 months. That is just amazing to me as our season in Northern Ontario lasts about 3 weeks. These berries were huge and extremely sweet for their size. At home the berries are considerably smaller but so so sweet. I’ve always assumed that was the trade-off (smaller berries equals sweeter berries). But, I’m pleased to report these big fellers were delicious. Peel 3 small lemons removing a thin layer of the outer rind to cut into star-shaped pieces. The rind can also be cut into thin strips or excluded altogether. Remove the remaining white pith and slice the lemons into 1/4 inch rounds then quarter each slice. 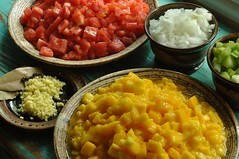 Put the star-shaped rinds and the lemon quarters in two separate bowls, covering with water. Cover each dish and set aside for 8-12 hours. Next day ~ Prepare for water bath canning. Place a few spoons and a plate in the freezer to test for doneness later on. Discard the water in both bowls of prepared lemons. 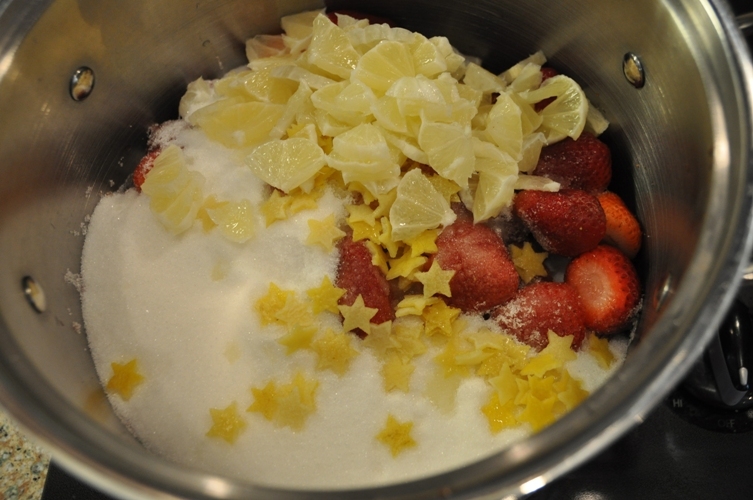 Put 1 cup of water in a small stainless steel saucepan and add lemon stars/rinds. Bring to a boil over med-high heat and boil for approximately 20 minutes or until rinds are tender. Wash strawberries well, remove tops and cut larger berries in half (or leave whole if that is your preference.) Keep in mind that strawberries are one of the fruits that are sprayed with a lot of pesticides so washing well is important. 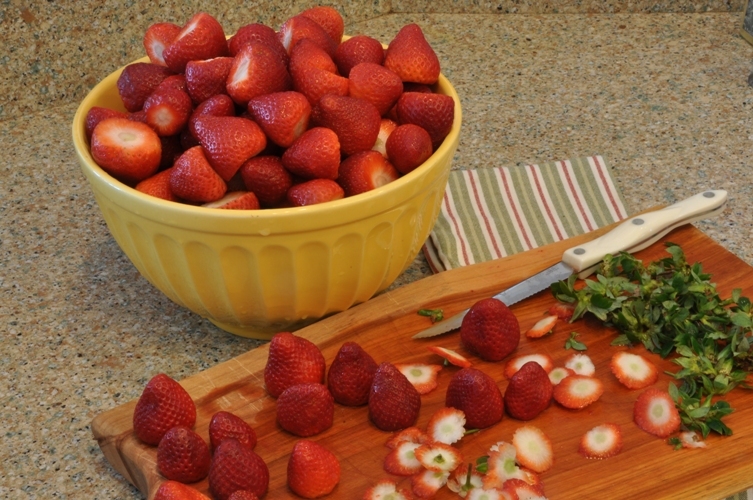 Combine strawberries, sugar, lemon membrane pieces, and rind in a large stainless steel saucepan and bring to a boil. Boil hard for 30-40 minutes, stirring constantly to be sure that it does not stick to the bottom. Note: You may want to reserve the star lemon rinds and add them a little later on. Although, they did maintain their shape the colour is lost during the cooking process. After 30-40 minutes remove the mixture from the heat and skim the foam. Add lemon juice and Drambuie and return to a boil for 5 minutes. Test for doneness. Ladle hot jam into hot sterilized jars leaving 1/4″ headspace, remove air bubbles, and top up jam if necessary. Wipe rims with damp paper towel. Center lids on rims and tighten rings until resistance is met (finger-tip tight). Process for 10 minutes in a hot water bath. Remove lid and wait 5 minutes. Remove jars, let cool, check seals, label, and store. Please note: the times for cooking above may vary depending on both your stove and the pot you use. We are working in a different kitchen and believe that our stove at home would probably reduce cooking time by 15-20 minutes throughout the whole process. 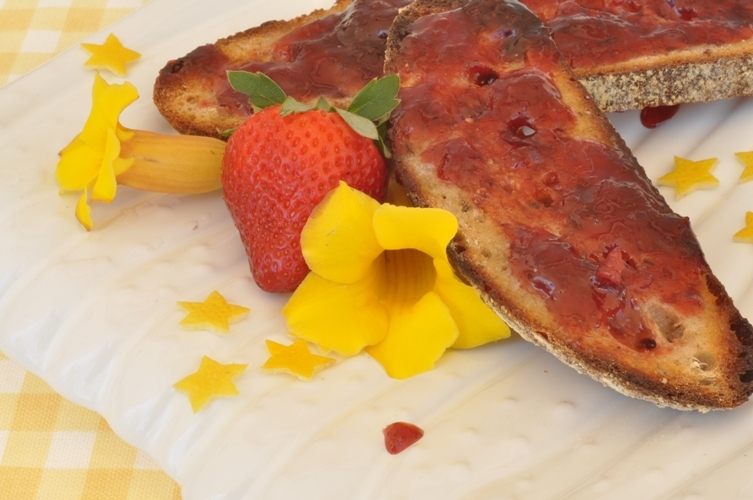 This jam is so delicious that it will have a special place in our pantry. The star lemon rind pieces add that little bit of lemony goodness that can only be described as a fresh flavour. The colour is rich, the strawberry taste intense, and the Drambuie blends in perfectly. I strongly recommend trying this jam. Oooh, does this look yummy. The star shaped rinds are so cute! How did you make that? We use these antique hand made miniature cookie/pastry punches. But, you could probably buy something new at a pastry shop or specialty cooking store. Or, just cut the rind pieces up into pieces. This jam is so good…I would strongly recommend trying it! I always add lemon to my strawberry jam. I think that really makes it good. I have never added Drambuie though…..sounds like a must try for me!! That reminds me…I think I still have some strawberry freezer jam, just waiting to be used up! What is Drambuie? A liquor? Drambuie is a Scottish liqueur made from Scotch whiskey. They add their famous and so delicious heather honey and an array of different herbs and spices to give it a sweeter taste. It can be found in the liqueur section. You have definately hit Florida at a great time for Strawberries!!! I’m closer to the famous Plant City strawberries in the middle of Florida and have already made a few batches of my strawberry jam. It has been just simply delicious and has sold very well at my craft shows. In fact the Strawberry Festival is going on in Plant City! I also made a big batch of chocolate covered strawberries for a pot luck at work and they disappeared very quickly. It’s been a really good harvest this year. I really want to try this receipe though because I completely love incorporating alcohol into ANY recipe as well as citrus. I started making Paula Deen’s blueberry lemon preserves and I don’t think I’ll make plain blueberry jam again! There are a couple of months left in our area for strawberries, so I’m trying to get in as many batches as I can get done because people want this stuff all year long! See…if you plan your travels just right you can hit strawberry season all year long and get the best tasting fruit every time! I made a batch of this last night, as my father and my sister’s FIL have been known to polish off a bottle of Drambuie in a weekend. When I asked my husband to lick a spoon, he said, “Wow. Wow. That tastes good. That tastes like alcohol.” I guess we know what he’ll be having on his toast next week. The taste of the liqueur is present, but it does compliment the strawberries and lemon. It’s a nice, well-rounded jam. I’m hoping it sets up a bit more as it sits, as it passed the freezer test, but looks a little soft in the jars. Thanks for the recipe! I am positive the guys in my family will love it, even if it stays syrupy. Drambuie syrup on ice cream doesn’t sound so bad! Just reading this has encourage me to crack open a jar for breakfast. This is by far one of my most favorites. I too hope it sets up more but it is a softer spreading jam (Matt prefers jams on the softer side)…it allows him to change to consistency and thicken the spreads (jellies, jams, and marmalades) if he wants to create something else out of them.